Well as most of the world knows, tomorrow is the second coming of Christ, The Rapture, Judgement Day. 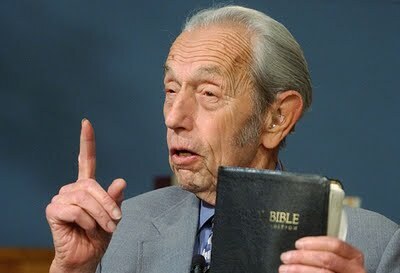 Well … according to Harold Camping. Ya’ll ready? Better get repenting real quick like because only about 7% of us (dead or alive) are going to get floated up to Heaven tomorrow. The other 93% of us are gonna live in “hell on earth” for another six months or so. Sounds fun. If I were a bettin’ man, and I am, I’d bet that the Van Full Of Candy flies through the air tomorrow with flying colors. This entry was posted in Comedy, End of the World, Predictions, Religion and tagged Christ, End of the world, forgiveness, god, Harold Camping, Jesus, Judgement Day, May 21, Nostradamus, Prediction, Rapture, repent, Second coming. I’m still here, too. I got all dressed up, but the Rapture people never called. There was supposedly some sort of scheduling conflict with the Holy One and Harold Camping. Harold apparently had a deadline on Monday, needed an excuse to get back to work and blamed all the confusion on his Texas Instruments calculator.